I stumbled upon a most excellent article called The Meaning and Measurement of State Legitimacy by Dr Bruce Gilley, formerly of Princeton University and now at Portland State. One of the most useful pieces of the article is the definition of State Legitimacy, which from my first reading appears to be interchangeable with the term political legitimacy. Gilley explores the subjects, objects and sub-types of legitimacy. Gilley then proceeds to do essentially what I have been discussing – a ‘strategy to achieve replicable cross-national measurements of legitimacy is then outlined and implemented, including a discussion of data sources and three alternative aggregation methods.’ He also has a book (right), which I’ve ordered. As ever, the footnotes and references are almost as invaluable as the text itself. His first paragraph says of political legitimacy that “it is ‘the core of political organization’ (Alagappa), the basis of the creation of political community that is the focal point of political science. Beetham called it ‘the central issue in social and political theory’, while Crick said it was ‘the master question of politics’.” I’ve edited the quote with links to the referred books. I’ll get to them in time. Some seem pretty foundational (like Crick’s ‘In Defence of Politics’) and probably highlight gaps from my primary education. 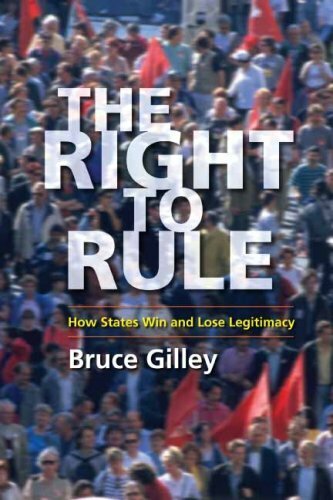 Gilley defines state legitimacy “as follows: a state is more legitimate the more that it is treated by its citizens as rightfully holding and exercising political power. This definition includes several substantive matters. It covers the subjects (citizens), object (state, holding and exercising political power), orientation (rightful), variable type (more/more) and expressions (treated) of state legitimacy. Indeed, at a deeper level, it implies much more: the ability of citizens to make autonomous judgements, the separability of political power from other types of social power and the validity of subjective views as the basis of legitimacy. In this definition, legitimacy is a concept that admits of degrees. While in the common language of rulers and ruled, legitimacy is used as a dichotomous term, in political science the term is most often used in terms of degrees, as a continuous variable.” Fantastic. I love this guy. Later in the piece (at p. 505) he presents a table of ‘indicators of legitimacy’. He divides these indicators into attitudes and actions. Again, the structure is useful. In each category, he divides the consideration into three areas – views of legality, views of justification, and acts of consent. It will be interesting to correlate Gilley’s legitimacy indicators with the Foreign Policy failed state index, and look at what areas are included or missing from each. That pre-supposes that state failure is the opposite of state legitimacy, a hypothesis I’m happy to run with for now. Dr Gilley proceeds in the article to outline a detailed data sources and aggregation methodology for assessing state legitimacy, in a way that appears similar to other indices I have seen, like the failed state index referred to above, and the UN Development Index. There are multiple indices, all correlated towards the grand finding of state score. I have no issue with this, it appears a reasonable methodology based on available data. The data is not so robust in less well developed countries, however, and there is a concern that the data may deceive. Similarly, there is a certain derivative aspect to the data – it is based on a predefined concept of state, and state structure, which in turn forms the basis for our international organisations, which are largely responsible for the statistics we use. Social media – notwithstanding the relative lack of penetration and immaturity of the technology and its social engagement – may offer a more comprehensive and fluid view of allegiance and community, if we can measure it. I’m no theist, but I found it interesting today as the Pope appointed several new Cardinals, warning that they should not let themselves ‘be allured by the worldly logic of power.’ There persists an undeniable homogeneity and a crushing consensus about the western liberal tradition, and free market economics. It is likely that should we see a change coming, it won’t be through the lens of conventional systems of measurement and observation. ‹ Do Supranational Organisations Compromise State Legitimacy?